Wide Glide Lodge Location at 402 Bass Loop Rd. Wide Glide Lodge sits on a corner lot surrounded by trees to give you that private get away you’re after. It’s just a few minutes drive to the lake if you are towing your own water toys. This cabin has a circular driveway making it easy for you to pull in and park your boats and trailers along with multiple cars. Enter through the front porch into the great room set up for comfort with reclining sofas and beautiful vaulted ceilings. The cut stone fireplace has gas logs with timer thermostat and a 55” HDTV is mounted above. Direct TV package (PPV not available) is accessed on all TV’s throughout the cabin. Upstairs you will find a spacious game room with pool table and a media room for enjoying a movie. There are 4 private bedrooms each with King Size beds, HDTV televisions and closets to store your belongings out the way. 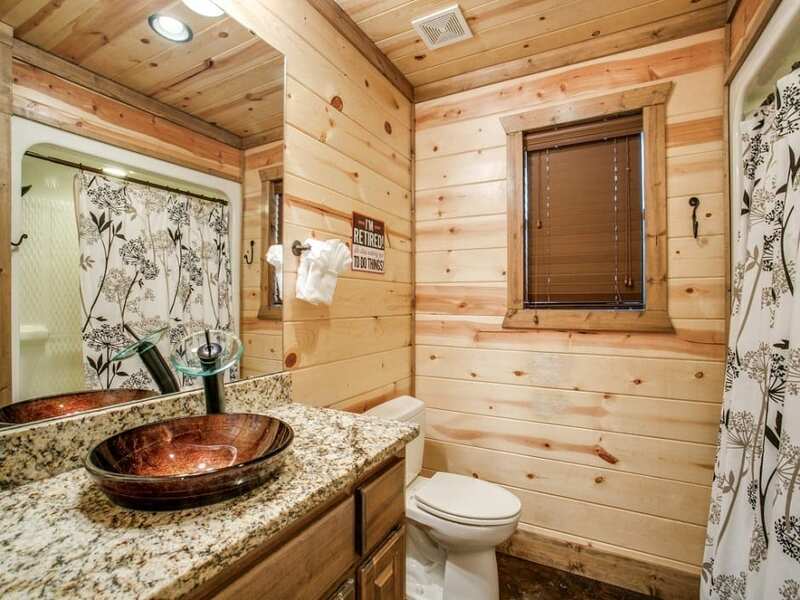 There are 3 full bathrooms as well. The master suite is spacious and open with a corner Jacuzzi jet tub and separate shower. The large kitchen comes fully equipped with glass cooktop/ oven, microwave, side-by side refrigerator, and dishwasher bringing all the convenience of home for meal preparations. Dine at the near by farm table with seating for 6. There is extra seating at the cut stone island with bar stools. On the back porch you will find a gas log fireplace, out door gas grill (propane provided) and a large dining table great for cookouts. 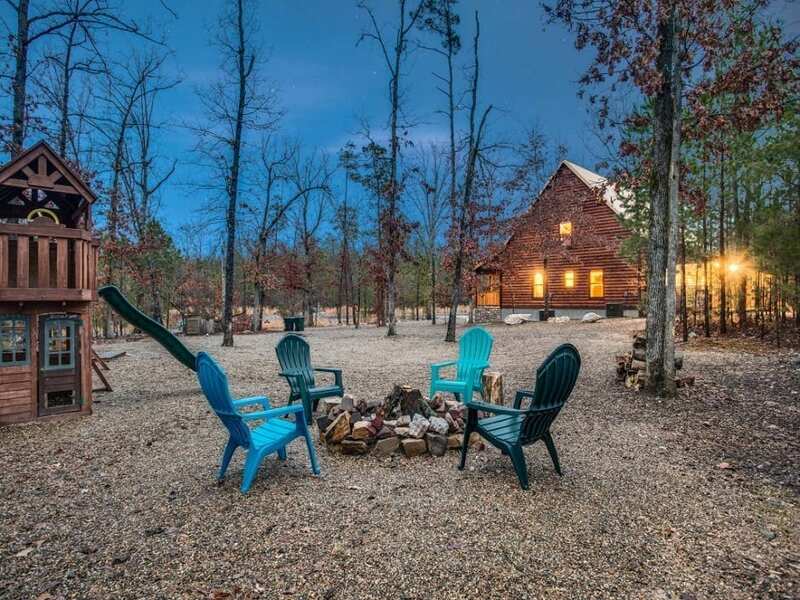 Take it to the fire pit next for some marshmallow roasting and your very own horseshoe tournament at the built-in horseshoe pit. There is also a swing set/play house for the young kiddo to burn off some energy! Make sure to end the evening in the hot tub to relax even more or let the kids swim and play. With the spacious rooms and open floor plan, Wide Glide is a perfect cabin for multiple families, groups of friends, fishing groups and team building retreats. There are so many activities within minutes such as boating, fishing, horseback riding, zip lining, ATV trails, and so much more! You will be near many restaurants as well in the area. So, head out and explore. Please click on the link for location of cabin. 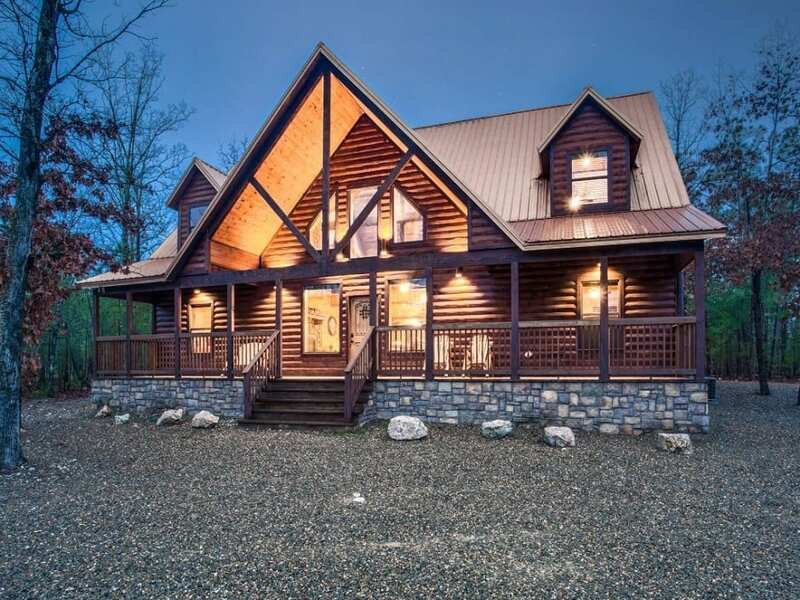 Wide Glide Lodge Location at 402 Bass Loop Rd.